Porketta is a childhood favorite of mine. I remember having it around the holidays…the local grocery store sold it ready-to-bake. I can only venture a guess that it was laden with MSG and other nasties that I don’t care to eat…and who really wants all that in their food anyhow? I recently found a recipe for it in the December 2012 issue of Food and Wine magazine (this link shows the step by step for you) and decided I had to make it. I made a couple mild adaptations for us GAPSters. I’ll share the recipe as it was written as well as my adaptations, and you can decide what best suits your tastes and/or dietary needs. **Note that total prep time is 2 days for brining and seasoning. In my rush…I missed this so only brined for a day and did not have time to season for a day. Just thought I’d better point that out in case there are other sloppy cooks out there too who don’t always read as thoroughly as they should…ha ha. 1) BRINE THE BELLY: In a large pot, add the rosemary, bay leaves, garlic, juniper berries, peppercorns, fennel seeds, crushed red pepper and 1 gallon of water. Bring to a boil and cook 10 minutes. Add the salt, sugar/and or honey and stir until dissolved. Pour the brine into a large roasting pan and cool. Add the pork belly, skin side up. Cover and refrigerate overnight. 2) MAKE THE RUB: In a small skillet, toast and fennel, juniper and peppercorns for a minute or two. Cool, the grind to a powder (again, I used a coffee grinder, works slick). Stir in the nutmeg, red pepper, rosemary and garlic. Drain the pork belly, pick off spices. With the belly skin side down, rub the meaty side with the spices. Refrigerate the pork uncovered overnight. 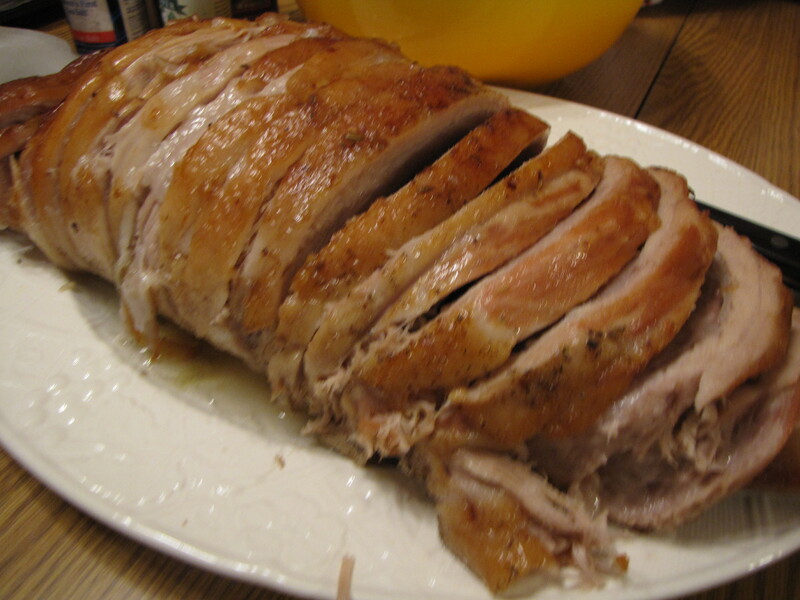 3) BAKE YOUR PORKETTA! : Before roasting, I rolled mine up (from the short end) and tied it tightly with cooking twine at 2″ intervals, and put it in a roasting pan. Preheat the oven to 400 degrees and bake covered in a roasting pan for one hour. Then, lower the heat to 300 degrees and roast for 2 hours and 15 minutes longer, until the skin is deep brown and crisp and an instant read theremeter inserved in the center registers 185 degrees. I’ll leave it covered until the last 1/2 hour or so, and then bake uncovered, to let it brown up. (And I frankly have my doubts about this timing…this is a big hunk of meat! So, use your own discretion and allow enough time for your own purposes…I’m just guessing it will take longer.) Anyhow…when it’s finished, transfer the porketta to a cutting board and let it rest for 20 minutes. Remove the twine and slice 1/2″ thick. I wish I had broccoli rabe – I think that sauteed rabe with garlic would be heavenly with this…but I don’t have any so I think we’ll settle for buttered carrots tonight. A couple of tips offered by “Food and Wine” magazine: This porketta can be prepared through Step 5 and refrigerated overnight. They also recommend for leftovers: Folded into an omelet with goat cheese and scallions…or a sandwich with ciabatta bread, melted provolone and sauteed broccoli rabe for any bread eaters out there. 🙂 We can’t eat goat cheese or ciabatta bread around here…but that does sound good!!! And a tip offered by me: If you can’t find these spices and herbs locally, Mountain Rose Herbs has a great selection and I think you can find it all here. I am not an affiliate at this time, and am offering this info as a public service only.